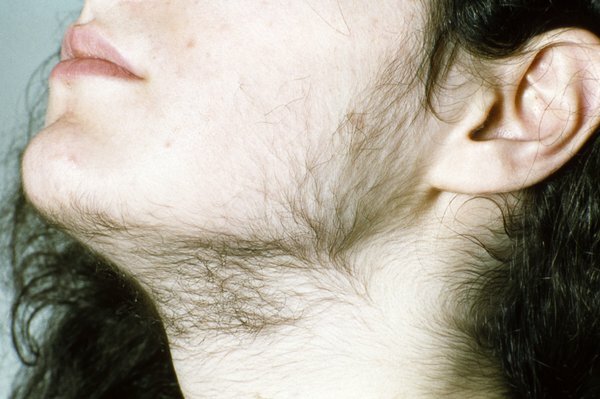 Hirsutism is excessive hair growth in certain areas of the body. It's a problem that mainly affects women. It's relatively common, although some women may find it embarrassing or distressing to live with. It's often a long-term problem, but there are a number of treatments that can help keep it under control. The excessive hair in hirsutism is usually thick and dark, rather than fine and fair. You may also have some additional symptoms, such as oily skin, acne, a deep voice, irregular periods or no periods at all. It's a good idea to see your GP if you have hirsutism. They can look for any underlying cause and advise you about the treatments available. Depending on what your GP thinks may be causing your symptoms, they may treat you themselves or you may be referred to a specialist. Treatment for hirsutism usually involves techniques to remove the excess hair and treatment to help slow its growth or stop it coming back. It may take a few months to notice the effects of treatment, so it's important to persist with it. In many cases, treatment will need to be continued indefinitely. Read more about the treatments for hirsutism. Hirsutism is caused by an excess of male hormones called androgens in your body, or by your body being more sensitive to these hormones. In many cases, it's not clear why this happens. Some women just seem to develop extra hair growth as they get older, particularly after the menopause. In younger women, the most common cause is polycystic ovary syndrome (PCOS), a condition that can cause irregular periods and fluid-filled sacs (cysts) on the ovaries.